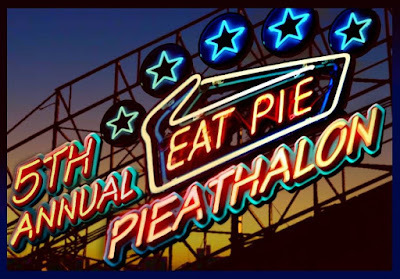 I was thrilled to be invited to participate in this year's 5th Annual Pieathalon! The premise of this Pieathalon is to make recipes from cookbooks that were published before 1990. I loved the challenge of not only being assigned a random recipe, but also the challenge of finding a cookbook pre-1990 as well as a recipe that I think would be translate well and interesting to modern eaters in order to submit for someone to be assigned to make and post. I have only a couple cookbooks that were published pre-1990, but I decided on my Grandma Veronica's The Pillsbury Family Cookbook which was published in 1963-- the recipe, Frosty Vanilla Pie, was assigned to the Battenburg Belle if you want to check it out at her blog! The recipe that I was selected to make was French Raspberry Pie from The New York Times Cookbook, published in 1961, selected by Wendy from A Day on the Life at the Farm. When I decided to make the recipe, I was a little concerned that the custard may not set, which is totally fine for eating (! ), but a little traumatizing for a food blogger. I made this a couple weeks ago and, to my horror, the custard did not set. The pie was absolutely gorgeous and the raspberries looked like little jewels, but once I cut into the pie, the custard ran all over the plate. And my photos of the pie sliced hilariously looked like slices of pizza! So I set out to make the pie again this weekend, which was scrunched into a massively busy weekend (girls night for a friend's birthday, a day trip to the lake, attending the Jonny Lang and Buddy Guy concert, and attending a friend's birthday party)! The back of my mind for the entire weekend was whether the custard was going to set and what I would do if I couldn't get it to thicken up. Then I thought, okay, mini custard tarts! They're small and elegant-looking where I could get away with not cutting into the tart. The custard is luscious and is beautifully offset by the tartness of the raspberries and the currant jelly. All of the flavors work so incredibly well in this pie, my family stated that this is one of their favorite new recipes (also keeping in mind this is while they were eating version with the runny custard). So runny custard or not, this is a recipe that aims to please your taste buds! And if you're looking to impress visually, I suggest making them as mini individual tarts, which you see in the photos here. In a double broiler or over low heat, scald the milk to 180 F degrees in a medium saucepan. Remove from heat and add in the vanilla extract. Mix together the flour, sugar, and salt. Add a little of the scalded milk, stirring until smooth. Add the flour mixture to the saucepan and continue to cook over low heat until the mixture is thickened. Whisk together the egg yolks and whole egg. Add a little of the hot flour/milk mixture and stir until smooth. Add the egg mixture back to the hot flour/milk mixture and cook, stirring constantly, until the mixture has thickened. The mixture should look like a thick pudding. Remove from heat, strain through a fine mesh strainer into a clean bowl, and cool completely. Once the custard is cooled, fold in the whipped cream. Spoon custard evenly into baked tart shell(s). Melt the jelly over low heat until melted, then pour or brush the jelly evenly over the raspberries. Chill for several hours until ready to serve. Beautiful! I think it was a brilliant move on your part to go with the tiny tart shells! They look absolutely delicious! (And I'm slightly envious about the Buddy Guy concert...sounds like a great time!) Enjoyable read...I liked seeing that once again you turned to your Grandmother for culinary inspiration! Those look beautiful! You've got quite the work ethic to give it a second try when the first wasn't photogenic enough. Lady, you win in the photography department. Gorgeous. I hope you had a lot of fun. Thank you for joining!!! These look so delicious! This one goes straight to the top of my list of ones to make! Those looks like something out of a bakery! Well done! Custard not setting...meringues falling.....It was definitely a challenging Pieathalon! So happy you were pleased with the recipe. They look lovely. Tiny tarts solve runny pies every time. I accidentally served a full-sized runny pie to people- it was so embarrassing. I had no idea until I cut it and--- bloop!